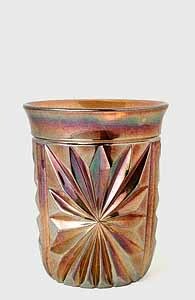 This pattern with a large multi-point star was made by the Finnish glass manufacturer, Riihimaki. Both pitchers and tumblers are quite rare. This tumbler, photographed while in the collection of John Britt, is in a light blue. 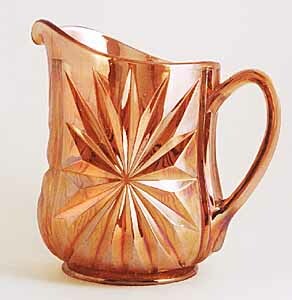 This 8-inch pitcher, in amber, sold in 2001 for $250 (with a chip). In 2004, two marigold tumblers, listed as variants, sold for $25 and $40.